Summer Shortboards: Which is the best surfboard model for you? Hey everyone! Hope everyone is having a great summer so far and been getting some good waves in with the fun swells we’ve had. Rather than an in depth Board Breakdown of one of my models, getting into the details of the rails, bottom contours, rockers, etc – I wanted to break down the entire Summer Shortboards model line to help explain how they compare to each other. First I’d like to say that the description “Summer Shortboards” is a bit misleading; while they’re designed to handle the typical waves we tend to get during summer, they aren’t by any means only limited to summer waves. In fact, many of my customers have switched to surfing these boards almost entirely and year round. They are quite versatile and tons of fun. 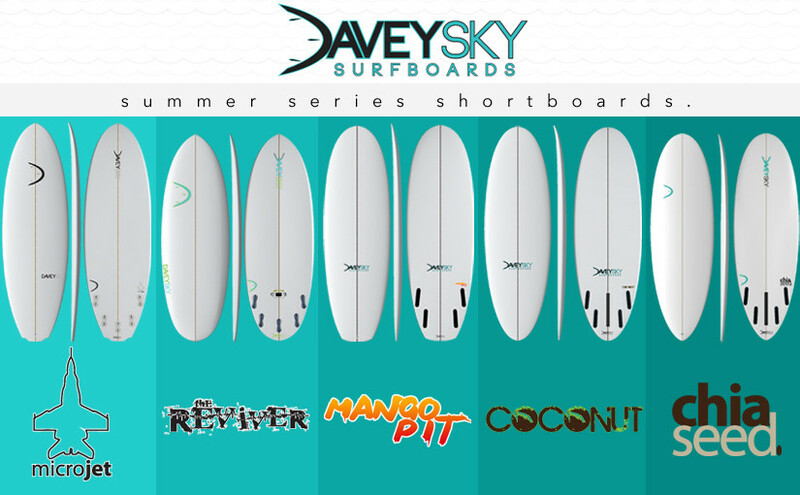 So the 5 current boards in the Summer Shortboard model line are the Reviver, MicroJet, Mango Pit, Coconut and Chia Seed. While there is some overlap between the models, they each have their own personalities and characteristics. To give a little perspective as quickly as possible: The MicroJet and Coconut have the most rocker, the Reviver and Chia Seed have the most overall width, and the Mango Pit has the most surface area. The Reviver and MicroJet were both designed with performance surfing and performance shortboard characteristics in mind, where as the Mango Pit, Coconut and Chia Seed were not designed with a performance shortboard heavily in mind – they were designed less around performance surfing and more around fun, versatility and ease of use. So first to compare the more performance oriented boards of the Summer Shortboards: the Reviver and MicroJet . The MicroJet more closely resembles and feels like a traditional high performance shortboard – you’d typically ride the MicroJet a couple/few inches longer than you would the Reviver. The MicroJet has more rail hold and therefore naturally hold better in bigger conditions. Even though it’s technically above its wave range it was designed for, I’ve had customers that have had the MicroJet out in 1′-2′ overhead waves and it held and surfed brilliantly. The Reviver, while it has less rail hold at high speed (I give it a comfortable max wave height of about shoulder high [this is due to it’s shortness, width and ultra low rocker]), it is more agile than the MicroJet and turns and maneuvers more readily. The Reviver paddles and catches waves a bit easier especially on the lower end of the wave spectrum due to its lower rocker than the MicroJet. So for the closest feel and characteristics to a traditional high performance shortboard, especially in a touch bigger surf, go with the MicroJet. For extreme agility, especially in shoulder high and smaller surf, go with the Reviver. Now on to the more laid back boards of the Summer Shortboards: the Mango Pit, Coconut and Chia Seed. Even though they’re not designed with high performance surfing or shortboards directly in mind, don’t be confused – these things can still crank out phenomenal turns and surf extremely well. The right surfer can surf these more or less just as critically as the Reviver or MicroJet. The Mango Pit is fast, fun, a bit loose and energetic. Although you don’t HAVE to surf it this way, it really likes a lot of user input, hence the description of “energetic”. The Mango Pit was designed for the energetic soul surfer. It catches waves incredibly easy – possibly easier than any of the other boards in the Summer Series Shortboards model line due to it’s extremely high surface area and ultra low rocker. The Mango Pit likes bowly, almondly wave faces best – in really pitchy, dredging conditions it can feel a bit squirrelly due to its relatively wide tail – though it’s pulled in behind the fins to help stabilize it out a bit and fit more naturally into the semi-pitchy waves we always seem to get here on the U.S. East Coast. It’s really fast and keeps its speed incredibly well through the flats. It’s an awesome longboard alternative, as well, as long as the waves have a bit of punch to them. The Coconut is designed to feel flowy and consistent underfoot. It’s super curvy and has enough rocker to fit into most any spot on the wave naturally. In some ways a one board quiver, especially if you order it as a Quad+1 or 5 fin convertible. It turns really well and consistently, drawing flowing, connected lines and turns, is quick and – best of all – is designed to give you no surprises. It’s super reliable and handles a very wide variety of wave conditions. It’s an excellent trip board, too. The Chia Seed is the most laid back of them all – with its pulled in but wide pin tail, it’s designed primarily for down the line surfing, flowing from the top to the bottom of the wave making primarily forward motion, and having long, drawn out turns and projection. 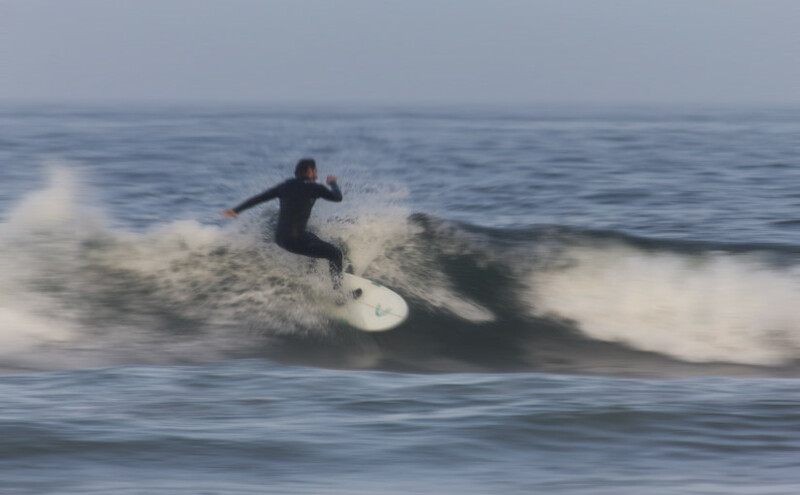 In some ways, you can think of it as having log/cruiser longboard characteristics as far as the way it was designed to be surfed – and I do have quite a few longboarders order the Chia Seed for that reason – who want a shorter board but maintain the longboard-esque style of surfing. So there you have it! The Summer Shortboards model line breakdown! While they do have some overlap, the Reviver, MicroJet, Mango Pit, Coconut and Chia Seed certainly all have their own unique personalities and characteristics. Hopefully this helps to categorize that for each model a bit better and lays out where they fall on the design and wave spectrum and will help make the best model(s) for you jump right off the page. As always, if you’re still not quite sure which model would be best for you and would like some feedback, have any other questions or are ready to place an order for your own custom surfboard, drop me a line at [email protected], call 732-701-7SKY (7759) or swing by any time during normal shop hours (though I highly recommend making an appointment so I can make myself personally available to meet and talk).